Description: The Surreal Bar is a unique decorative knot suitable for bracelets, belts, choker necklaces, and other similar Macrame projects. The cords are folded so there is a loop at one end. The loop can be used as a clasp. You can make it with four cords if you don't need the loop. You must use two contrasting colors to see the pattern. 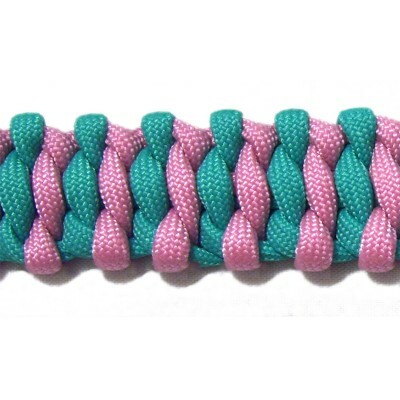 Any type of material can be used to make this design, including the Paracord shown in the example. 2018 Update: The beginning steps have been changed to produce a more stable loop. Contact me if you need the original page. 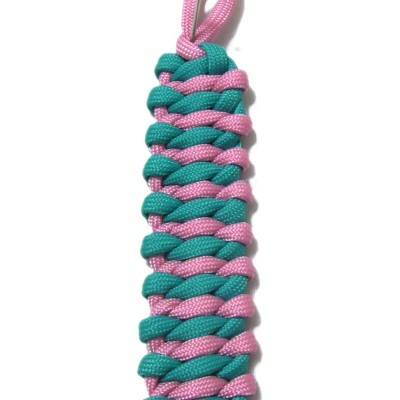 This pattern is from the Fusion Knots website. It's listed under the name Surreal Solomon Bar. To practice the Surreal Bar, you need two 60-inch cords (different colors). 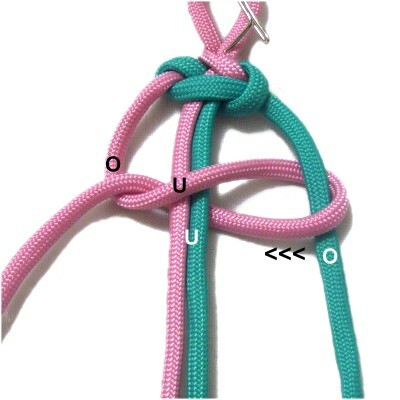 In the example, cord A is pink, and cord B is turquoise. 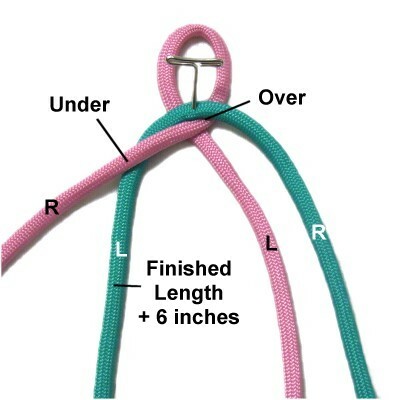 For a project, the two cords should be at least 10 x the finished length of the item you are making. 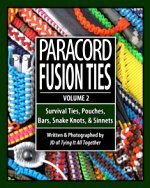 Please read the bottom section of Cord Preparation if you plan to use Paracord, which is the material seen in the example. 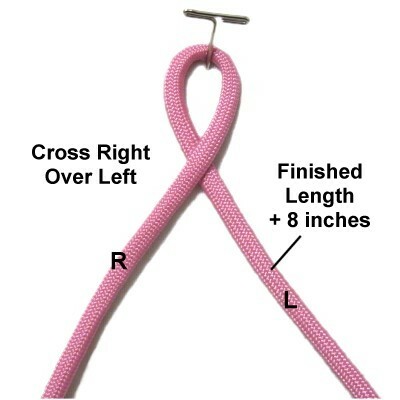 Step 1: Measure from the left end of cord A down to the finished length + 8 inches. Make a loop at the measured point, crossing right over left. The short segment should be on the right after crossing. Measure from the left end of cord B down to the finished length + 6 inches. Fold it at that point. 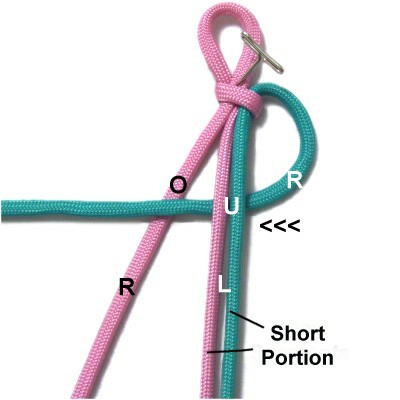 Arrange it so the short portion is on the left, and is resting under the right portion of cord A. 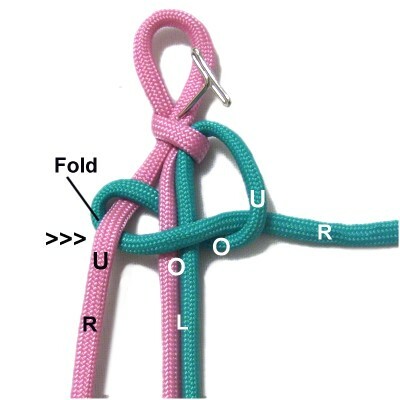 The folded area should rest over the crossing point of the loop. Secure it at the fold. Move the left portion of cord A in a clockwise direction, passing over the right portion of cord A and the left portion of cord B. Pass it under the loop. Move the left portion of cord A to the left, passing over everything in its path, which includes both parts of cord B and the right portion of cord A. 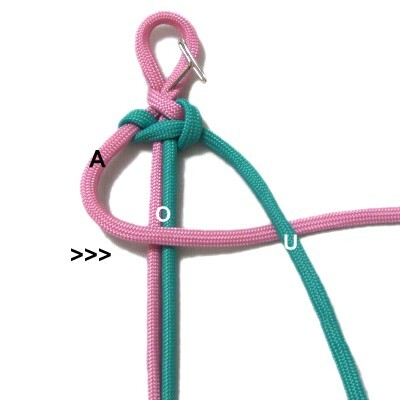 Pass it under the segment furthest to the left (cord A). Tighten the Slipknot firmly. 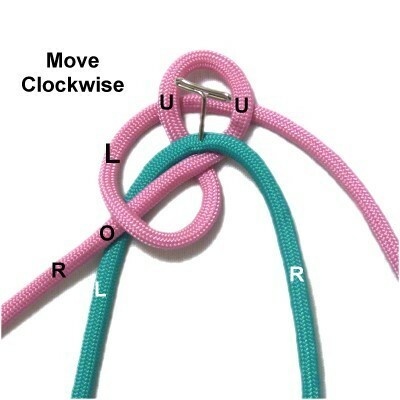 Adjust the size of the loop at the top by pulling the right portion of cord A. 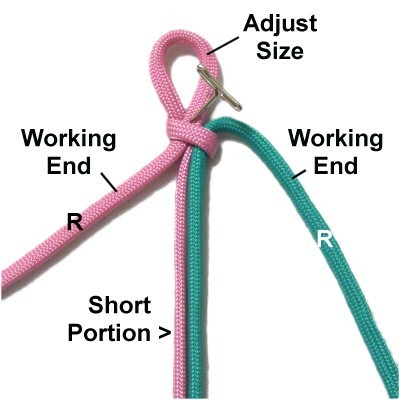 The short portion of both cords (left segment) should now be in the center. They are the fillers. The right portion of the cords are the working ends. Designer's Tip: The loop at the top can be moved too easily, so secure the crossing point of the loop as shown in the images. This way the loop will stay the same size as you work with cord A. Step 3: Move the working end of cord B under both fillers, heading right to left. Place it over the working end of cord A. Fold the working end of cord B under cord A, heading left to right. Move it over the fillers and through the curved area of cord B over - under. Step 4: Tightening each row in the Surreal Bar is done in two steps. 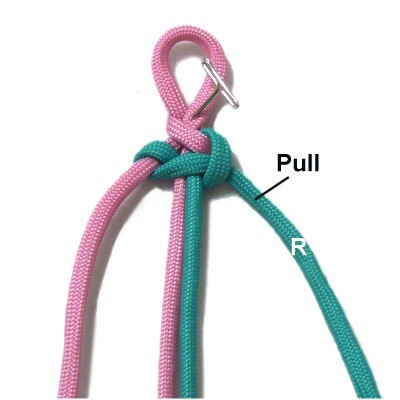 The first step is to pull cord B where it folds around cord A on the left. 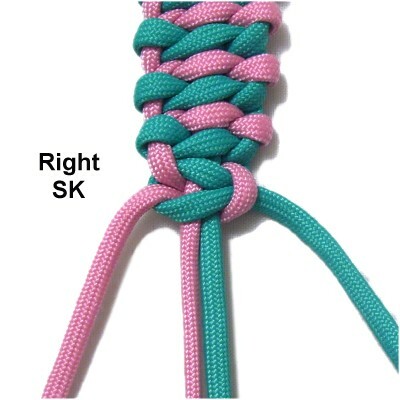 This tightens the right side of the knot. Tighten the left side and center area by pulling on the working end of cord B. Step 5: Move the working end of cord A over the fillers, heading left to right. Pass it under the working end of cord B. Fold the working end of cord A over cord B, heading right to left. Pass it under the fillers. 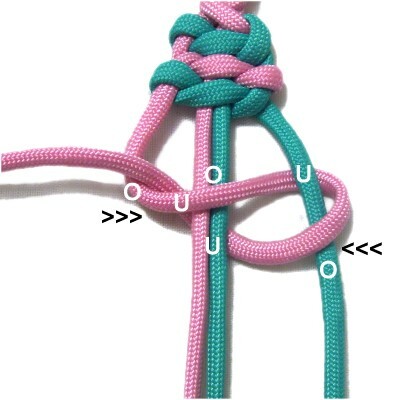 Pass it through the curved area of cord A under - over. Step 6: Remember that tightening the Surreal Bar is done in two steps. 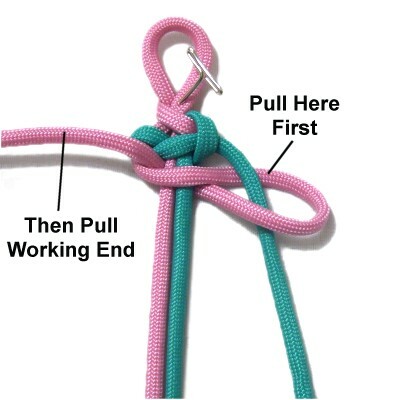 Pull cord A close to the folded area to tighten the left side, then pull the working end. Step 7: Repeat steps 3 - 6 several times, or until the Surreal Bar is the correct size for your project. The next two images show the path of each cord. 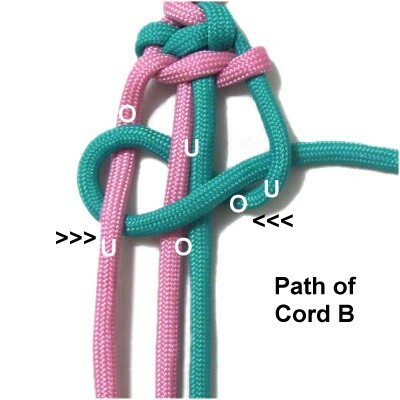 This image shows the path of cord B (step 3). 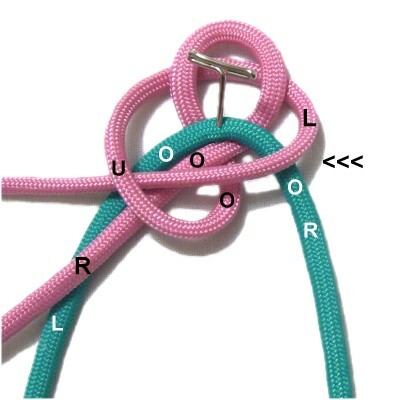 This image shows the path of cord A (step 5). You can finish the Surreal Bar by tying a RIGHT SK with the working cords around the fillers. Turn the bar over to see the front. The side you've been looking at is the back. 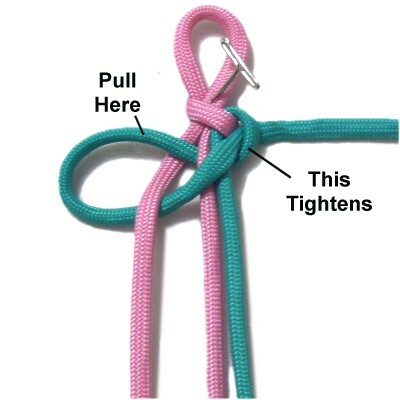 The fillers can be used to tie a button knot if you need a clasp. The working ends would be finished off. Have any comments about the Surreal Bar? Contact Me.